NEW YORK (March 21, 2017) – Today, the New York Cosmos announced an official partnership with INARIA, a leading designer and manufacturer of soccer apparel and equipment. 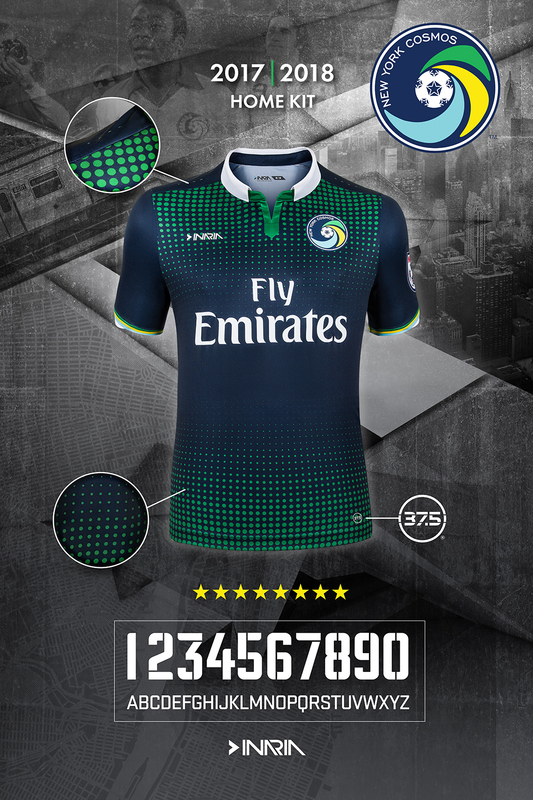 Starting with its away NASL Spring Season match on March 25th against Puerto Rico FC and running through the 2017 North American Soccer League (NASL) Season, the Cosmos will wear custom kits and apparel produced by INARIA. Plans for the new kits will feature 37.5 ® technology – soccer’s fastest drying fabric, which dries up to five times faster than similar materials. The 2017 INARIA New York Cosmos’ kits were unveiled today at the teams Media Day event. INARIA has extensive uniform partnerships with professional clubs, NCAA Division I teams and elite amateur programs, including Schwan’s USA Cup. Also in the NASL, San Francisco Deltas and Edmonton F.C. are exclusive partners. Inaria also holds a partnership with Toronto F.C.’s Sebastian Giovinco, the 2015 Landon Donovan MLS MVP Award recipient. The New York Cosmos are reigning champions of the NASL, having won their second consecutive NASL Championship and eighth overall on Nov. 13, 2016, with a 4-2 win on penalties over the Indy Eleven in The Championship Final. The Cosmos began play in 1971, spending 14 seasons in the NASL, winning five league championships. During this time, the club brought some of the biggest names in world soccer to the USA including Pelé, Franz Beckenbauer, Giorgio Chinaglia and Carlos Alberto. The Cosmos returned to NASL competition on Aug. 3, 2013, winning the championship in their first season back in the league. Raúl and Marcos Senna, legends at famed Spanish sides Real Madrid and Villarreal CF, each suited up in Cosmos colors for modern era championship runs, adding their names to the impressive list of global soccer stars who played with the club.For more information on the New York Cosmos, please visit nycosmos.com, join us on Facebook and follow us on Twitter and Instagram (@NYCosmos).